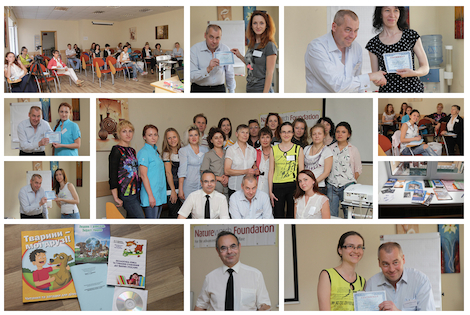 As part of Naturewatch Foundation’s education project to teach all school children and university students across the whole of Ukraine about animal welfare and responsible pet ownership, we conducted our third seminar on 21 June 2014, this time in Kyiv city centre. Our previous seminars were attended by teachers, however, this seminar was aimed at animal welfarists and municipal inspectors who coordinate education programmes and conduct lessons for children on animal welfare and protection. The aim of the seminar was to assist them to work closely with teachers to support them and motivate them to include animal welfare within their day-to-day lesson plans. The seminar, named “Animal Welfare and Humane Attitude to Animals Education in Schools”, was presented by Sasha Bogachyk to 21 delegates from 11 different regions across Ukraine. Importance of education as part of the work of animal welfare NGOs. What is animal welfare (animal’s needs, five freedoms, use of animals, suffering of animals). Cognitive dissonance theory - the connection between cruelty to animals and man. How does the teaching of animal welfare and humane attitudes fit into school education? Animal welfare education (targets, methods, animals in the school). Anthropomorphism, cruelty to animals, animal welfare school politics. Animal welfare within environment sciences. Examples of animal welfare education lessons. Training work booklet with all training materials, notes and tasks covered in the seminar. Teacher training book for teachers «Humans and the Environment - Animal Protection». Teacher training book for teachers «Ecological Ethics and Humane Attitudes to Animals and Plants». DVD containing two videos: «Animals and Us» produced by the RSPCA, and the training video « Responsible Pet Ownership in Primary Schools» produced by Sasha Bogachyk. Children’s book «Animals are My Friends». Children’s book «Traveling to the Animal World» issued by the RSPCA and a Ukrainian NGO, containing cartoons to illustrate anthropomorphism in animals. The printed material was also supplied in PDF format to allow easy access and sharing by teachers. The fourth seminar, which is due to be carried out later this year, is to be attended by teacher trainers from across other areas of Ukraine that didn’t attend our first two seminars in Lutsk and Lyviv. We are making good headway to reach all teacher trainers across the whole of Ukraine by the end of 2014!